BioLogos have an article on the firmament of Genesis 1, "The Firmament of Genesis 1 is Solid but That’s Not the Point", by Peter Enns. He begins by twice asserting that biblical scholars agree that the expanse (raqiya`) is solid and appeals to observation of the horizon and the assumption ancients thought the world flat. Ancient Israelites “saw” this barrier when they looked up. There were no telescopes, space exploration, or means of testing the atmosphere. They relied on what their senses told them. Even today, looking up at a clear sky in open country, the sky seems to “begin” at the horizons and reaches up far above. Ancient Israelites and others in that part of the world assumed the world was flat, and so it looked like the earth is covered by a dome, and the “blue sky” is the “water above” held back by the raqia. Really? Clouds clearly move across the sky, as does the sun and moon, and even stars. Does the sky really look solid, or is solidity invoked by some cultures to explain rain? Enns does not mention that a curved horizon could lead observers to think the earth spherical, especially combined with observing lunar eclipses. He goes on to discuss word meanings. The translation “firmament” (i.e., firm) gets across this idea of a solid structure. The comment on "firmament" is unhelpful because, although it does carry the idea of firmness, he implies by using the word "translation" in the above sentence that raqiya` means firm when the etymology of "firmament "is actually via Latin. Biblical scholars agree on this understanding of raqia. For some Christians, however, this is troubling. How can the Bible, which is the inspired, revealed word of God, contain such an inaccurate piece of ancient nonsense? Hence, some invest a lot of time and energy to show that the raqia is not solid but more like the atmosphere. Often, the word “expanse” is the preferred translation because it does not necessarily imply something solid. We will note here that Young's Literal Translation published in 1898 uses the word "expanse". And "expanse" is considered more accurate given that raqiya` is more likely related to "spread out" than it is to "solidity". The second problem is a much larger theological issue, but is actually more foundational. Regardless of what one thinks of the raqia, why would anyone assume that the ancient cosmology in Genesis could be expected to be in harmony with modern science in the first place? Well it may not be in harmony with modern science, by why can it not be in harmony with the truth? If the atmosphere is how it is, why can Scripture and science not both be in harmony with this? Is it somehow better to have Scripture not concordant with the way things are? Modern science understands pregnancy in greater detail than understood by the ancients. Following Enns here it would seem that an inaccurate understanding of the virgin birth by the ancients be more likely to be recorded than an accurate one. But the ancients knew that virgin conceptions were impossible, even if they did not understand activation. Why cannot the ancients appreciate a non-solid expanse even if they did not understand partial pressures of gases, absolute temperatures, and triple points? Every observable can be considered a fact of science. Should every observation in Scripture be expected to be at odds with reality because it can also be described by modern science? As a matter of clarification, I don't think that Genesis is in harmony with several scientific cosmologies. Genesis and modern science are neither enemies nor friends, but two different ways of describing the world according to the means available to the people living at these different times. To insist that the description of the sky in Genesis 1 must conform to contemporary scientific is a big theological problem. It is important to remember that God always speaks in ways that people can actually understand. In the ancient world, people held certain views about the world around them. A mother might tell her four-year-old ‘you grew inside my tummy’—this is not false, but language simplified to the child’s level (‘tummy’ as a broad term for the abdominal region, but not as specific as ‘uterus’). Conversely, ‘the stork brought you’ is an outright error. The greater problem here, however, is separating knowledge into scientific and biblical. Yes they are distinct, but by nature of the way they arrive at knowledge. They are epistemologically distinct. But that does not mean they speak to different topics. They may make competing claims on the nature of reality and real events of history. To have an account in the Bible that corresponds generally to the way things actually are, even if that coincides with contemporary science, is hardly a theological problem. Speaking of the sky as being stretched out like a canopy/tent (Isaiah 40:22) or that it will roll up like a scroll (34:4) are clearly similes and do not support the view that raqia in Genesis 1 is non-solid. Item #1 may be true, but then perhaps the Israelites didn't borrow as much as we think, especially when we consider that Genesis 1 is much older than other cosmologies often referenced. I have not identified every occurrence nor researched their content so cannot answer item #2. Genesis 7:11 and 8:2 reference the "windows of heaven" and the "fountains of the great deep". These are likely idioms. Nor does either passage actually suggest that the "windows of heaven" let thru the "waters above". In item #5 he mentions that birds fly on the face or surface of the expanse to which I concur. But this means that the surface at least is non-solid, and other passages mention birds within the expanse/ heavens. Using Enns' own reasoning here the expanse must be non-solid. Item #6 is a difficult issue. I have addressed it here. The problem is that while etymology is helpful, it is not definitive. And it is likely that the idea transferred to the noun is "spread out", not the metal which happens to be beaten. Item #7 is errant. These are clearly similes as I discuss here, but the association between the tent and heavens is that they are stretched out, not the material they are made from. The sky is stretched out like the way that a tent is stretched out. Consider the phrase, "The boy ran like lightening." This is a simile, but no one would interpret the simile implies the boy is made of electricity. I don't have much to address in the latter part of the essay. I do not give a lot of credence to the phenomenological argument he tries to refute, other than saying that idioms do not necessarily mean what they literally say. But Genesis 1 is not using an idiom here. The moon comment is irrelevant. Objects can be lights directly or indirectly. The moon is a light whether it intrinsically produces electromagnetic radiation, or just reflects it. It is important to be clear on what we have a right to expect from Genesis. This is central to making progress in the conversation between science and faith. And while I agree with this statement, Enns fails to mention what we can expect from Genesis. I suspect what he and I think is reasonable to exegete from Genesis differs considerably. A repeating theme is that ancient Israelites did not have modern knowledge (or equipment to gain them scientific knowledge). This assumes that what they wrote was based on their (false) beliefs about cosmology, which is usually assumed to be borrowed from other contemporary cultures. It is important to note here that Christians understand Scripture to be supernaturally revealed. Of course the Bible is historical. It touches events in history that were witnessed by Hebrews within and Gentiles without. We have documentary and archaeological evidence on biblical happenings. However while authors used historical sources and observation, insights into the meaning of events was often given by God. And even some historical events require supernatural revelation; how else would we be privy to dialogue between Yahweh and Satan concerning Job? It would seem that Genesis 1 as history would need to be exclusively revealed as no humans witnessed it. If God created the universe, and if he could reveal the events of the 6 days of creation, and if Genesis 1 can easily be interpreted in line with what we actually observe about the earth and the atmosphere, then why the the desire to force errancy? Of all tyrannies, a tyranny exercised "for the good of its victims" may be the most oppressive. I read a fair number of articles. This is a paraphrase of one but I have seen similar several times over. In conclusion our results show that exposure X is associated with significantly increased chance of outcome Y. Public health recommendations/ government agencies should reduce/ ban exposure X. This is frustrating for several reasons. 1. The word significantly usually means statistically significant. That is the authors are confident that the association they have found is a real one, not a chance one. For various reasons I think many findings that are claimed to be real are actually chance, so I may not be convinced the statistics justify the conclusion. But assuming the statistics do justify it, the significance relates to the degree of confidence in the result, not the size of the result. The phrasing "significantly increased chance" sounds like the size of the association is strong. It may be minor. A risk ratio of 1.003 (1.002–1.004, p <0.001) is statistically very significant but not functionally significant. Even a risk ratio of 3 (i.e. you are 3 times more likely to develop outcome Y) may be irrelevant if the outcome is extremely rare. Does it really matter if you increase your risk from 1 in a million to 3 in a million? 2. Association is not causation. Yes it may be a real effect, and it may be a relevant one, but it still may just be an association. We need to establish causation. Addressing a problem if it is causative may not resolve it. Addressing an association that is not causative definitely will not resolve it. And it could potentially worsen it. We need studies that show definite causation. Then we need studies that show intervention to reduce exposure X actually reduces outcome Y. 3. Nothing in the research relates to public policy. The study does not show that the policy was enacted and was effective. Even convincing knowledge that reducing outcome Y by preventing public exposure to X does not imply anything should be done by the state about X. Should the state ban hang-gliding because it is associated with increased mortality? Should it make every vice illegal because of detrimental effects on self? And there are further question about enforcing a ban. What about the monetary cost considerations? What about liberty? Will the unintended consequences be worse than the problem? Perhaps all that is warranted is education. For example the government can mandate labelling without banning a substance. I am not arguing against any public policy. It just seems that socialism is so embedded in some people's psyche that new information to them logically implies government intervention. I am having some family time in warmer climes sans adequate internet access. I will attempt to use the scheduling feature on Blogger with which I have variable success. I am unlikely to respond to comments or remove any inadvertently hung in spam. Douglas Adams (1952–2001), Mostly Harmless. A selection of apparently epic photos. While I would not agree with all the selections/ suggestions, there are some interesting pictures. The first—pale blue dot—is overrated, the third is better. The second is a little disturbing. 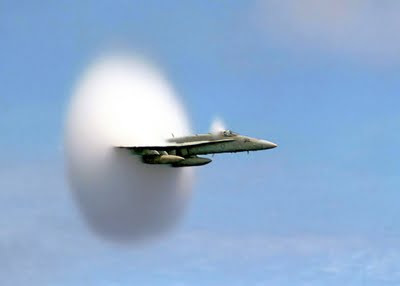 I quite like this one which I have seen previously: jet breaks the sound barrier. I've always argued that if we depart this world and see anything resembling the Bill of Rights at our next destination, we'll know we're in hell. In reading comments around the internet that denounce capitalism, examples of its supposed unfairness are frequently given using corporations. Now there are a variety of things about corporations that may be good or bad. But it is important to note that corporatism is not synonymous with capitalism. In fact many capitalists and free-marketers think little of corporations. Now I am not against corporations competing within the marketplace. They can use their capital to be productive and offer low priced goods to consumers. I am not against large companies. It is true that larger amounts of capital potentially allow more efficient production; but it does not ensure it. And I don't think that small companies are unable to compete. Price is an important but not sole consideration for consumers, and smaller companies may have other advantages. Small businesses account for significant proportions of Gross Domestic Product in many countries. But there are some aspects about corporations as they do exist (not as they have to exist) that are unpalatable and frankly anti-free-market. The idea of a limited liability company seems questionable from a Christian perspective. Individuals can lose all their money. To run a business that allows you to take a greater risk and thus a potential greater gain, but not a greater, or even a complete loss seems unfair. Although in a system that allows unreasonable settlements in litigation I see the limited liability as the lesser evil. But what is really irksome is special government favours for corporations. Unequal taxes, subsidies, guaranteed monopolies, separate law. This is not in the spirit of capitalism and annoys true capitalists as much as it does socialists. Perhaps more so as some socialists may justify specific corporations they happen to approve of, whereas capitalists may be competing in the marketplace against such an unfair advantage. Taking money from once group to benefit another is generally a feature of socialism whether the recipient is poor or wealthy. So if you despise capitalism and identify questionable practices by corporations as your reason, note that it is unlikely it is capitalist practices that make the corporation unjust, rather its anti-capitalist behaviour.